Why did the EPP vote against Orbán? On 12 September, the European Parliament voted to pursue disciplinary action against Hungary for breaching the EU’s core values. Fabio Wolkenstein explains that the European People’s Party (EPP) has faced a difficult balancing act in relation to Viktor Orbán’s ruling Fidesz party, with many EPP members critical of Fidesz, but the EPP itself relying on Fidesz MEPs for support in the Parliament. However, the fact that a majority of EPP MEPs voted against Fidesz on 12 September does not mean the EPP is ready to abandon the party: the consequences of the vote are likely to be minimal in the short-term, and the EPP’s leadership may simply have sought to appease Orbán’s critics within their ranks without facing up to the costs of a radical break. Last Wednesday, the European Parliament took the unprecedented step of triggering a disciplinary procedure against Hungary: 448 out of 693 MEPs voted for a proposal calling on the Council to determine whether there is a “risk of a serious breach by Hungary of the values on which the Union is founded.” Anyone who occasionally reads a newspaper might wonder: why did this happen now? Is it not blindingly obvious that the Hungarian government has been violating the values on which the Union is founded ever since 2010, when Viktor Orbán’s Fidesz party came into power? One need not even endorse values like the rule of law, minority rights, or academic freedom to accept that Orbán’s regime never respected them. To understand why the so-called Article 7 procedure was only initiated last week, and not as far back as, say, 2011, it is important to remember that Orbán’s Fidesz party has a powerful ally at the EU level: the Christian democratic European People’s Party (EPP), which is the largest party group in the European Parliament. Fidesz is itself a member of the EPP, and it enjoys the latter’s protection. As VoteWatch Europe writes, “most members of the EPP… are standing by … Fidesz, shielding it from the attacks of its opponents.” To cite just one example, the European Parliament rejected a call on the Commission to activate the Article 7 procedure during December 2015’s European Parliament plenary session, and the votes of the EPP were instrumental in bringing about this result. Why has the EPP protected Fidesz? One much-discussed reason is that Fidesz reliably delivers votes to the EPP. 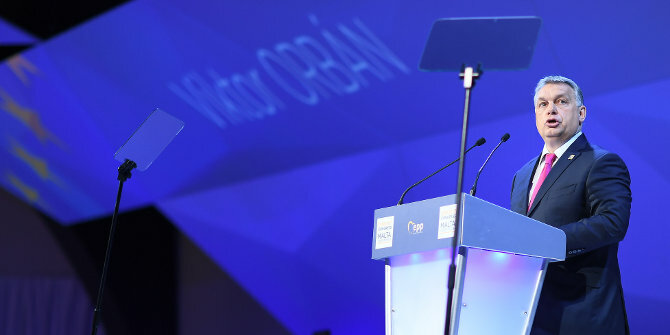 Given that Orbán’s party dominates the political landscape in Hungary, EPP leaders can count on it to secure a relatively large number of seats in the European Parliament for the Christian democratic bloc. In this light, it also makes perfect sense that Joseph Daul, the president of the EPP, emphatically wished Fidesz “all the best” for the Hungarian parliamentary elections earlier this year, and unashamedly praised Orbán’s ability to bring “stability and prosperity” to Hungarian citizens. This begs the question of why 114 out of 199 present EPP members decided to vote in favour of disciplinary measures last week. One thing the outcome of the vote suggests is that there is now a critical mass of EPP members who genuinely want to put pressure on Orbán’s government. Perhaps Orbán’s recent attacks on academic freedom and his increasingly unrestrained anti-Semitism (think of the anti-Soros campaign) crossed a red line for some Christian democratic MEPs. But the EPP is also divided on the issue: there are also still numerous MEPs – especially from the Visegrád countries (though not Poland), Romania, and the Bavarian CSU – who openly support Fidesz or at least do not want to offend the powerful Hungarian leader. A total of 57 EPP MEPs voted against triggering the Article 7 procedure, and 28 abstained. This creates a dilemma. If the EPP leadership lets a majority of their MEPs vote against Fidesz, they risk driving Orbán’s party out of the EPP, hence losing Fidesz’s valuable votes in European Parliament elections (Orbán has already hinted that he could leave the EPP and form a far-right alliance that would fight it in next year’s European Parliament elections). If, on the other hand, they attempt to ensure that a majority of their MEPs vote against the disciplinary procedure, they might put their own support within the party group in jeopardy. This could prove fatal for figures like Manfred Weber, the EPP group’s leader in parliament, who needs to get a parliamentary majority behind him to achieve the goal of becoming President of the European Commission in 2019. What makes this dilemma less pressing is the easily-overlooked fact that the vote of the European Parliament simply does not matter very much. It is of course true that the vote sends a “warning signal” of sorts to the Hungarian government, and in this sense it would be wrong to say that it does not matter at all. But now the baton passes to the Council, made up of the governments of EU member states, and the Council seems highly unlikely to take further actions against Hungary. So, the EPP leadership could, in a sense, have its cake and eat it too: they could let anti-Fidesz MEPs vote as they wish without worrying about any more than “symbolic” consequences for Orbán’s party. Why exactly is the Council unlikely to take action against Hungary? Because to conclude that there is a “clear risk of a serious breach of the values on which the Union is founded” would require a majority of at least four-fifths of the Council’s members – and this is very difficult to achieve given how much influence Orbán’s supporters exercise on governments across EU member states. Beyond the governments of the Visegrád states, with which Orbán generally has warm ties, avowedly pro-Fidesz parties are in government coalitions in Italy (Lega) and Austria (FPÖ). And one must not forget that the Bavarian CSU, which forms part of the German government, has over time built a strong alliance with Fidesz. The sympathies between Fidesz and the CSU go deeper than is often appreciated: at a speech at a conference held in memory of Helmut Kohl, Orbán recently described Fidesz as the “CSU of the European People’s Party”, expressly comparing his own political agenda to that of the Bavarian Christian Democrats. In sum, the perhaps most plausible interpretation of why the EPP – for the first time – chose not to protect Fidesz is that the vote is unlikely to have much impact on Orbán’s party. In these circumstances, EPP leaders can appease Orbán’s critics within their ranks without facing the costs of a radical break with Fidesz, which would seem imminent had the Parliament’s decision actually resulted in concrete sanctions. To some, this might seem like opportunistic behaviour, and maybe there is some truth to this. But let us not forget compromise and accommodation have always been defining principles of Christian Democracy. If the EPP appears to be an overly broad church, in which ultimately both liberal and illiberal forces have their place, it is because Christian Democracy has looked like this all along. Fabio Wolkenstein is Assistant Professor at Aarhus University and affiliated researcher at the University of Amsterdam (UvA). His work has appeared in such journals as the American Political Science Review, the European Journal of Political Research, the Journal of Common Market Studies, Party Politics, and Political Studies. He holds a PhD from the London School of Economics and Political Science. Is this article “preaching to the converted” ? …. without showing any evidence. On the rare occasion when something approaching “evidence” is shown, it is often framed / edited / contextualised, thus adding to confusion and doubt. Perhaps some links to the egregious statements and policies would be helpful ………. ? ?